Coming out of the metal hotbed of Richmond, VA, Inter Arma has been a rising name since the release of their sophomore album, 2013's wonderful Sky Burial. That rise only increased in speed and height in 2014, when they released The Cavern, an absolutely stunning forty-five minute sole composition EP featuring a litany of guests. The band now returns with their next full-length, Paradise Gallows and it's little surprise that it is a worthy, exemplary addition to the band's discography that will continue to elevate them up the metal ladder. What is a surprise, though, are some of the changes that Inter Arma throws on to the table with Paradise Gallows. Sky Burial and The Cavern were classic examples of genre-bending; elements of sludge, progressive metal, and a host of other musical sub-genres that were found within their run times. With Paradise Gallows, Inter Arma hasn't abandoned this musical cacophony, but one genre seems to elevate itself above the rest: doom. This isn't to say that Paradise Gallows sounds like a Candlemass or Pallbearer or even a Cough album, because it doesn't, and I can't emphasize enough (although I'll try) how Inter Arma's musical buffet sensibilities are as strong as ever, but overall, Paradise Gallows feels best described as a doom album. Beginning with the beautiful instrumental melody of "Nomini," Paradise Gallows opens with a mournful, bereaved air. The feeling doesn't last long, as the shift into "An Archer in the Emptiness" is intense, immediate, and in stark contrast to "Nomini." Opening with T.J. Childers' massive drumming, "An Archer in the Emptiness" is a powerful statement that shares more in common with funeral doom than anything else. Vocalist Mike Paparo bellows from the depths of the riffs, and aside from a notable guitar flourish courtesy of either Steven Russell or Trey Dalton, the song more or less stays within the low, bombastic element it establishes from the get go. "Transfiguration" begins as some unholy blackened doom concoction, but it's the end of the song that truly soars, with Childers' pounding drums backed by Joe Kerkes' powerful bass and a repeating guitar riff that becomes dizzyingly hypnotic. "Primordial Wound" begins with something akin to Gregorian Chanting and ends with Paparo's most venomous vocals to date, all over sludged out riffs that feel the most familiar to Inter Arma's previous work. Buoyed by a springy bass line, "The Summer Drones" has a bluesy sound to much of its runtime, before amping up the distortion and feedback at the (much heavier) end. While not my favorites on the album, the 1-2-3 punch of "Transfiguration," "Primordial Wound," and "The Summer Drones" may be most important to Paradise Gallows, as they showcase Inter Arma's considerable talents while highlighting where the band has been, where they are now, and where they could go (anywhere) in the future. "Potomac" finds the band returning to the guitar melody from "Nomini" before moving into a heavier (yet piano-based) instrumental jam that thankfully bucks the interlude trend and goes on for a full six minutes. I'm a firm believer that any band worth their salt should have at least one full-length instrumental song, and "Potomac" delivers upon the promise with which "Nomini" kicks off Paradise Gallows. "Potomac" is powerful and thought-provoking, displaying the full abilities of Inter Arma to make whatever genre of music they damn well please, and to do it exceptionally well to boot. For all the words I've expounded on the rest of Paradise Gallows, "The Paradise Gallows" and "Violent Constellations" are the album's highest of high points. "The Paradise Gallows" starts off quietly before abruptly transforming into Ahab-esque funeral doom, featuring wailing guitars emerging from Paparo's bellows and Childers' and Kerkes' powerfully deep rhythms. That "The Paradise Gallows" simultaneously reaches such soaring heights and pummeling depths is a testament to where Inter Arma is as a band. Even then, the track is just a warm up for "Violent Constellations," Inter Arma's best-ever song. Childers' elevates his work in the opening, absolutely pummeling his drum kit while leading into an abrasive combination of sharp riffs, rumbling bass, and searing vocals. If "The Paradise Gallows" is a hurricane churning over the ocean, then "Violent Constellations" is the storm making landfall, smashing the ocean waves against the cliffs and uprooting trees. "Where the Earth Meets the Sky" is a dark, acoustic ballad that joins Cough's "Still They Pray" at the top of the list of unexpected great acoustic tracks this year. It really has no right to be as good as it is; honestly, it should feel like a letdown after "Violent Constellations," but it doesn't. It comes across as the total devastation after the storm, and partners with "Nomini" to make perfect bookends for Paradise Gallows. In a good and just world, Inter Arma would already be receiving the crossover press and accolades (with none of the derision!) of bands like Deafheaven and Pallbearer. In our actual world, Paradise Gallows ensures that the band is about to skyrocket in popularity. 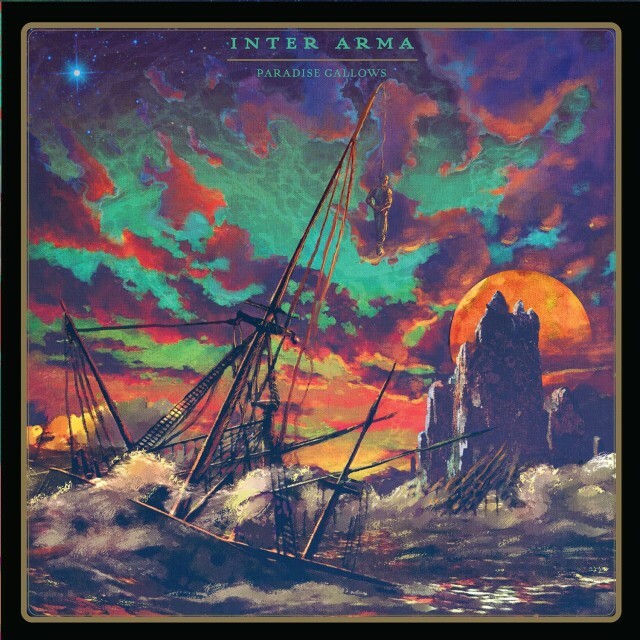 Inter Arma has crafted a statement album, one that is a definite Album of the Year candidate as well as heralding their arrival into the upper echelon of working metal bands. 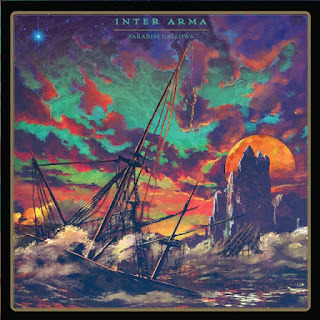 The way Inter Arma mixes and matches and bends genres to their will in the name of crafting the best possible songs and albums is inspiring, and should not be missed.